According to a report out today by Nielsen, a whopping 59% of females and 52% of males have privacy concerns when it comes to location-based services. You can’t download an app these days without it asking for your location–and not just on check-in services like Foursquare and Gowalla. Google Maps, Instagram, Twitter, Square, MenuPages, Shazam–they all want to know exactly where you are whenever you’re using the app. 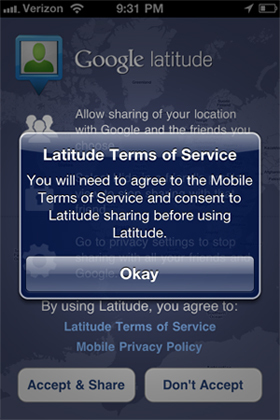 Heck, services like Google Latitude won’t even let you decline to share your location–it’ll just put you through an endless cycle of notifications, almost demanding you to accept its terms. Perhaps that’s why location sharing has become such a huge concern for users, who worry they’re giving out too much data via their GPS-enabled smartphones. According to a report out today by Nielsen, a whopping 59% of females and 52% of males have privacy concerns when it comes to location-based services. Even more telling? Just 8% of females and 12% of males have no concerns about these apps, a surprisingly low figure given the popularity of check-in services. For most people, location sharing is still a novel practice–years ago, who could’ve thought we’d constantly (and voluntarily) be transmitting our whereabouts, in many cases for fun? It takes some getting used to, of course, and a level of trust with the services users are sharing their data with. Nielsen’s report indicates a growing comfort for location apps: younger users (18 to 34) are more comfortable with using location services, whereas concern rises significantly for each age group after 35 (45 to 54, and 55+). “As consumers become increasingly familiar with location-based apps, and as marketers earn their trust and become more savvy about understanding what benefits consumers expect in exchange for that information, consumers will become more comfortable with the idea of location-based mobile applications,” Nielsen says. The study could not have been timelier. Only yesterday, news spread like wildfire that detailed location data is being collected by iPhones, and logged in an easily accessible file on the computer the device syncs with. If Nielsen decides to do a similar survey in the coming weeks, we can only imagine privacy concerns will have increased further.